PatientsLikeMe is dedicated to building a platform for the open sharing of personal health data. So far, our community of patients have shared over 600,000 outcome surveys, 300,000 treatment histories, and 2.3 million symptom reports. We believe this enormous collection of health data will dramatically improve how patients manage their conditions. But there are more benefits to joining a community of patients like those on PatientsLikeMe than just sharing data: the social support from interacting with other patients has a real effect on improving patient outcomes. In a recent study published in the Journal for Medical Internet Research (JMIR), our research team found that nearly half of survey respondents (n = 559, 42%) agreed that the site had helped them find another patient who had helped them understand what it was like to take a specific treatment for their condition. Furthermore, the survey shows that those patients on PatientsLikeMe who make close relationships with other members receive significantly more benefits from those who do not. 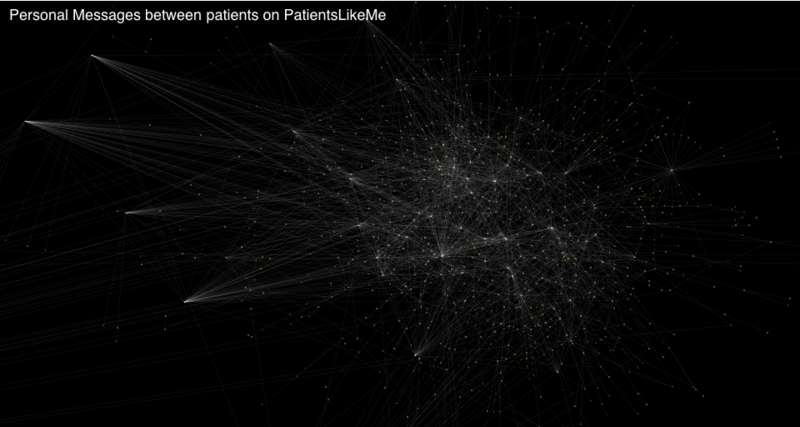 So it is worth taking a moment to look at just how extensive the social connections are on PatientsLikeMe, and how many patients have reached out to other patients and helped improve their lives. While these numbers show just how much sharing has been going on, the following graph illustrates what the connections are like between our members. In this graph, the dots represent patients, and the lines between them connect any two patients who have shared at least 5 personal messages together. Note how many patients are interconnected. By reaching out to one another for support, conversation, data sharing and more, you’ve created a universe of dialogue that has never existed amongst patients like you. Click for full-sized version. 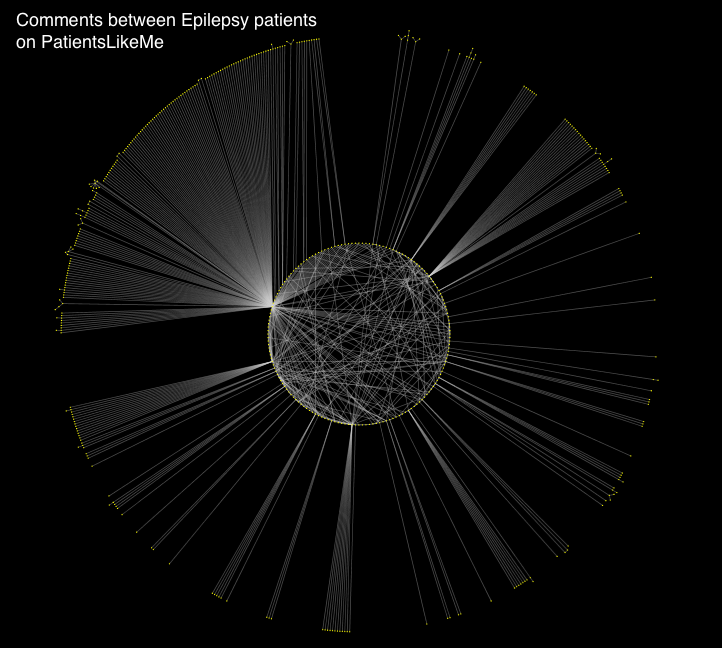 A graph showing personal messages made between some of the patients on PatientsLikeMe. The dots represent patients, and a line represents at least 5 personal messages between them. Moreover, what you’re sharing with each other through these various connections represents the largest data set of its kind linking conversations to outcomes and overall health experience. This week on the blog, we’ll delve into some of these connections that have been spurred by some of our members. However, we also want to recognize that even the silent contributors (those connecting behind the scenes or outside of the forum spotlight) are as much to thank for this open network. All for one and one for all.